Hi Genghis Khan (c. 1155/1162/1167 - Agosto 18, 1227) nga natawo ha ngaran nga Temujin usa nga makarit nga pinuno han militar nga ginurusa an mga Mongol nga tribu ngan hiya an nagtukod han Imperyo Mongol. An mga khan, nga nagsunod ha iya, ginhimo an Mongolia nga gidadako-i nga imperyo ha kalibutan. Hi Genghis Khan amo an lolo ni Kublai Khan, nga naging siyahan nga emperador han Dinastiya Yuan han Tsina. Hasta yana waray maaram kun ngain ginlubong hi Genghis Khan. ↑ Central Asiatic Journal (O. Harrassowitz) 5: 239. 1959 http://books.google.com/books?id=PjjjAAAAMAAJ |url= missing title (help). Ginkuhà July 29, 2011. ↑ Rashid al-Din asserts that Genghis Khan was born in 1155, while the Yuanshi (元史, History of the Yuan dynasty records his year of birth as 1162. 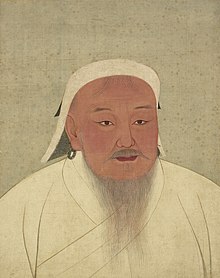 According to Ratchnevsky, accepting a birth in 1155 would render Genghis Khan a father at the age of 30 and would imply that he personally commanded the expedition against the Tanguts at the age of 72. Also, according to the Altan Tobci, Genghis Khan's sister, Temülin, was nine years younger than he; but the Secret History relates that Temülin was an infant during the attack by the Merkits, during which Genghis Khan would have been 18, had he been born in 1155. Zhao Hong reports in his travelogue that the Mongols he questioned did not know and had never known their ages. ↑ Ratchnevsky, Paul (1991). Genghis Khan: His Life and Legacy. Blackwell Publishing. p. 142. ISBN 0-631-16785-4. "It is possible, however, to say with certainty that Genghis Khan died in August 1227; only in specifying the actual day of his death do our sources disagree." Ratchnevsky, Paul (1992, c1991). Genghis Khan: His Life and Legacy [Čingis-Khan: sein Leben und Wirken]. tr. & ed. Thomas Nivison Haining. Oxford, UK; Cambridge, Mass., US: B. Blackwell. ISBN 0-631-16785-4. Chapin, David (2012). Long Lines: Ten of the World's Longest Continuous Family Lineages. College Station, Texas: VirtualBookWorm.com. ISBN 978-1-60264-933. (Frinanses) Farale, Dominique (2002). De Gengis Khan à Qoubilaï Khan : la grande chevauchée mongole. Campagnes & stratégies. Paris: Economica. ISBN 2-7178-4537-2. (Frinanses) Farale, Dominique (2007). La Russie et les Turco-Mongols : 15 siècles de guerre. Paris: Economica. ISBN 978-2-7178-5429-9. "Genghis Khan". Funk & Wagnalls New Encyclopedia. World Almanac Education Group. 2005. http://www.historychannel.com/thcsearch/thc_resourcedetail.do?encyc_id=210250. Ginkúhà dida han May 22, 2008. Via the Internet Archive's copy of the History Channel Web site. Smitha, Frank E. "Genghis Khan and the Mongols". Macrohistory and World Report. Ginkuhà June 30, 2005. Kahn, Paul (adaptor) (1998). Secret History of the Mongols: The Origin of Chingis Khan (expanded edition): An Adaptation of the Yüan chʾao pi shih, Based Primarily on the English Translation by Francis Woodman Cleaves. Asian Culture Series. Boston: Cheng & Tsui Co.. ISBN 0-88727-299-1. Kradin, Nikolay; Tatiana Skrynnikova (2006). "Why do we call Chinggis Khan's Polity 'an Empire'". Ab Imperio 7 (1): 89–118. 5-89423-110-8. May, Timothy (2001). "Mongol Arms". Explorations in Empire: Pre-Modern Imperialism Tutorial: The Mongols. San Antonio College History Department. Ginkuhà May 22, 2008. Saunders, J.J. (1972, repr. 2001). History of the Mongol Conquests. Philadelphia: University of Pennsylvania Press. ISBN 0-8122-1766-7. Juvaini, 'ala-ad-Din 'Ata-Malik (1958). History of the World-Conqueror. tr. John Andrew Boyle. Cambridge, Massachusetts: Harvard University Press. pp. 361. http://archive.org/details/historyoftheworl011691mbp. Ginkúhà dida han 2012-04-16. Ini nga pakli kataposan nga ginliwat dida han 23:36, 10 Disyembre 2017.